A beautiful destination wedding in Florida.....something fresh and exciting for brides that make their home in the Midwest. In today's bridal trends, destination weddings are becoming more and more popular. Even if you live elsewhere, you can take your flower With you and enjoy watching the dreams of that special day take shape, without the worry of fresh blooms fading. Sarah Beals, of Dame and Maiden featured one of her wedding dresses in a special photo shoot made in Florida.Sarah creates one of a kind wedding dresses for brides, that are worn all over the country, as she is able to design and send your gown to you. This bride was able to have her dress made here in Iowa, and then wear it all the way across the country, in Florida! Lavender Blue Floral was contacted to create a permanent botanical bouquet that would accentuate the bohemian style of this lacey, flowing gown. The setting would take place on the beach in Florida, so the colors needed to play well with the theme. Lavender Blue loves to create permanent botanical bouquets for their brides. Many years of education and experience has allowed for solid expression of the designs. Starting with a color palette and a theme, we build from there, with quality blooms we hand-select and good mechanics to insure a lasting bouquet. The beach bouquet was made with peach anemones with a yellow center, cream ranunculus, and blue hydrangea. The greenery used is always a well- played combination of textures and shades. This bouquet has fern leaves and ivy, along with other trailing vines. These elements allow for good design, moving your eye all around the piece, taking in each petal and leaf with enjoyment. 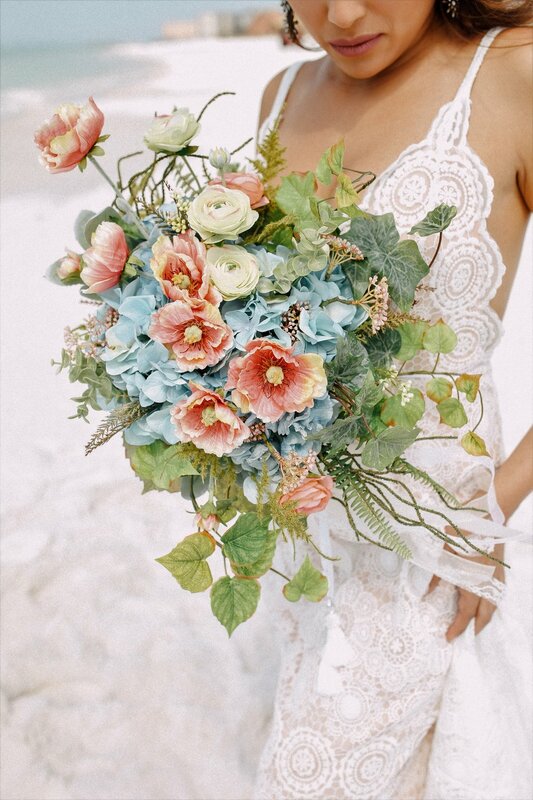 The interaction of these dusty blue steps with the bright white of the dress, and the pops of peach from the bouquet result in an amazing image! C7 Studios Photography, in West Des Moines Iowa created the story of the beach wedding, working their magic from behind the lens. It's not difficult to imagine your own special day on the beach, embracing your loved one, and dreaming about your future together when the surroundings are so beautiful. If you are thinking of a destination wedding, consider having a permanent botanical keepsake bouquet made by Lavender Blue. You will have your 'forever bouquet' to look at, alongside the photos of this day for years to come. If you would rather have a fresh floral bouquet on your day, we can always re-create it with everlasting blooms for you to keep. Let's chat about your vision for the special day you have planned! Lavender Blue is a Master Florist, who also holds a Master Gardener certification. We know our Flowers! We love to take the look and feel of the fresh florals that you like on Pinterest, and transform that look into a "forever bouquet" that will travel with you to your destination wedding. Our designs are very well constructed and made with the best quality silk flowers and greenery available thru our extensive range of resources. The bouquet can be large and flowing, like what the trendy brides are carrying , but very light in weight and without allergy-causing components. We also love to replicate your fresh bouquet from your wedding day. Bring us a clear picture, or email it to us of your wedding bouquet, and we can make another that will last forever! It is a great idea to have something as a keepsake, along with your wedding dress, but also works great as a part of your anniversary pictures down the road! Check out our Instagram for the latest on lavender blue...… we are here for you!! Older PostLavender Blue Moves into a New Studio!